How long will the training take, and when do I have to have it completed? Our philosophy allows members to best fit their volunteer fire service life into their personal life. If you want to become an Interior Firefighter, it’s going to take the biggest initial time investment as the PA Entry Level Firefighter Program is 182 hours. Good news: the program is divided into modules and can be completed within a few months’ time, or spread out over time as an individual can fit the classes into their schedule. With the Support, Exterior, and Interior Firefighter levels, take a little or as much time as you need by serving at the Support or Exterior levels until you’re ready to complete the next level of training. In many cases, it’s better if you spend a little more time as a Support or Exterior Firefighter as you have more time to learn fire department operations in a role involving less stress. How much time will I be expected to volunteer? On average, members dedicate about 40 to 50 hours of time each year. To maintain status as an active member of the organization, attend at least ten company events (calls, training, work details, public events, meetings, etc.) within a calendar year. To maintain status as a member authorized to respond to calls, you must meet minimum training time based on your firefighter status level. For Interior Firefighter, you will need attend at least ten training events and a total of twenty hours of training in a calendar year. For the Exterior and Support Firefighter levels, at least 5 training events are required, along with a total of ten hours of training in a calendar year. Administrative Members must meet the ten-company event in a calendar year requirement to stay active. Most of our active members far exceed these minimums. If you don’t have a lot going on at home, meeting these minimums should be achievable. If you’re working through serious work, family or health issues, you will always have options to change status to level, or put membership on hold by requesting to be placed on Honorary status until you’re ready to return to active duty. Will I have to pay for equipment and training? No. All required equipment and training is paid for by us. Will I be required to be on call at certain times? No. Members are encouraged to respond to calls whenever possible, but we have not found the need to require duty or on call times for members. What if I am at a call and must leave for work or family responsibilities? Let the officer in charge of the incident know that you must leave. For extended calls, we often try to identify members that need to leave, and release them on vehicles no longer needed at the scene. Yes. There are two types of probation. As a member of the company, meaning your ability to participate at meeting, vote on company a matters and elections, and run for elected positions, you must serve a probation period of one year. As an operational member (meaning your status as a firefighter), probationary status depends on the level of training you have completed. A six -month probation period is required for members with a level of training below Module 4 of the PA Entry Level Firefighter program. New members without previous fire training are on probationary status until completion of Module 3 of the Entry Level Firefighter program. How will other members know my probation status/level of training? Different colored helmet shields are issued based on probationary status and training level to help officers and senior firefighters identify a member’s capabilities when assigning tasks. Members responding from home will go to the station closest to them. We have three stations in the Township of Pine. Our main station is at 228 North Chapel Drive, Wexford, PA 15090. Our station 2 is at 11041 Babcock Boulevard, Gibsonia, PA 15044. 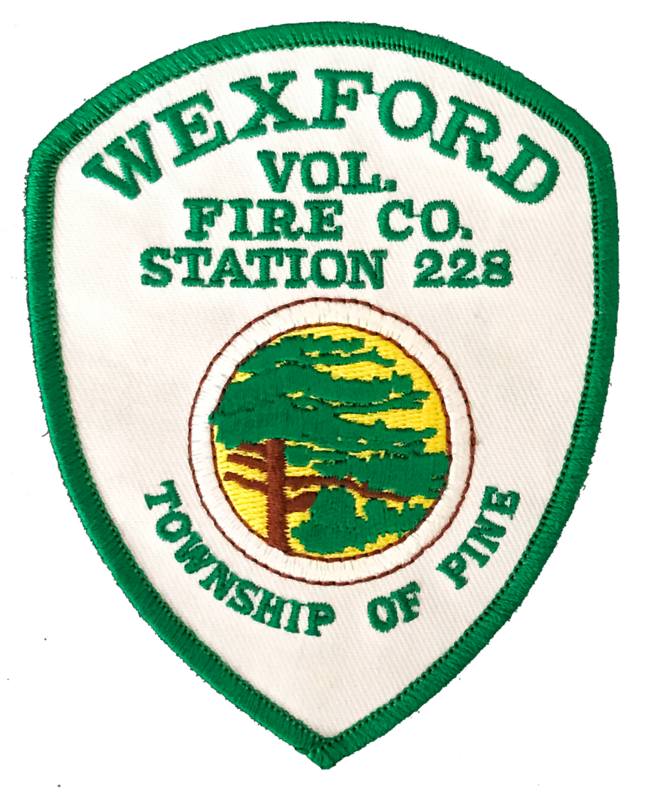 Our station 3 is at the Pine Municipal Building, 230 Pearce Mill Road, Wexford, PA 15090. Do I need to provide clearances? Yes. Because we have minors through our junior member program, anyone aged 18 or older must provide clearances as required by the PA Child Protective Services Law. Specific information on how to obtain this information can be obtained by clicking on the clearance page. What if I am injured while performing my duties as a volunteer? The Township of Pine is required by the state to provide workers’ compensation insurance for the volunteer fire company. If you’re injured, your care will be administered through the Township’s workers’ comp insurance carrier.